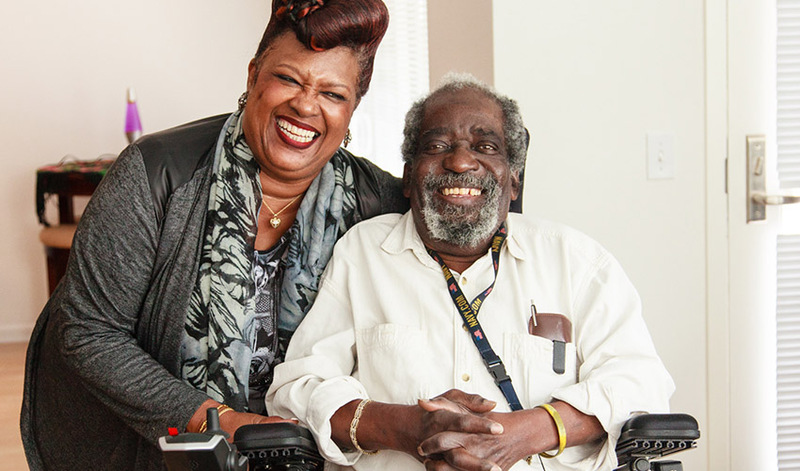 San Francisco State University alumna Marilyn French-Speller (M.A., Gerontology, ’11) with a Meals on Wheels SF client, Jimmy Davis. Photo courtesy of Meals on Wheels. March is National Nutrition Month, but not everyone has access to healthy food. Older people are some of the hardest hit, with low-income seniors sometimes forced to choose between buying good food and paying for their medications or even their rent. Other seniors can suffer from malnutrition when they become isolated without family members to help out. A related issue is that many older people are hospitalized for one reason or another. If sent home without follow-up care — including access to nutritious meals — they often end up back in the hospital. A recent study by researchers at San Francisco State University and Merritt College found that one simple but effective program — Meals on Wheels (MOW) — improves seniors' health and reduces the number of return hospitalizations. The interdisciplinary study was conducted by Darlene Yee-Melichar, SF State professor and Gerontology Program coordinator; Mary Louise Zernicke, dietary manager program director at Merritt College; and Visakha Som, an SF State student who was working toward her master’s degree in public administration in 2017. The team analyzed data on 1,078 people from a national survey of older Americans to explore the impact of MOW and similar food delivery programs on health, hospitalizations and food insecurity. Their analysis, published in the journal Trends in Geriatric Healthcare, shows that older adults who received home-delivered meals had improved health outcomes and reduced hospitalizations. “If the federal government doesn’t help, I’m fearful that some of these elders won’t get the meals they need to survive and thrive." The researchers are concerned that federal support for MOW — which represents 35 percent of its funding — may be in danger due to steep domestic budget cuts under the Trump administration. MOW delivers millions of meals every day to homebound senior citizens, says Yee-Melichar, and while the service is partially funded by donations, those contributions are not always consistent. As simple as it may sound, a nutritious meal can make all the difference to older people. Som, Yee-Melichar and Zernicke see food as preventative medicine. “We believe food can be positioned as a medically necessary intervention to combat diabetes, cancer, dementia and many other diseases,” said Som.